Drop in water levels at the many reservoirs courtesy El Nino weather conditions had me making tracks to the Kotmale reservoir for a glimpse of the Kadadora Sri Priyabimbaramaya Vihara, one of the ancient temples that went underwater when the Kotmale reservoir came into being. 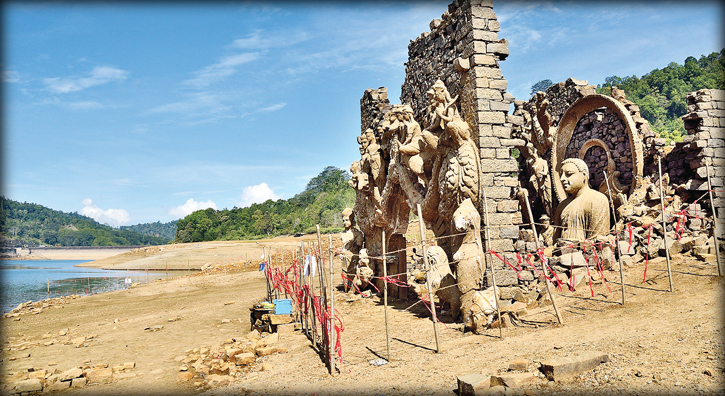 The diminishing water levels meant the Vihara was visible in all its ruined glory for the first time in 35 years. No wonder the reservoir has become a tourist magnet, with large groups thronging to reservoir bed several to pay homage to the spectacular Buddha statues of the KadadoraVihara. The journey was exciting because of the anticipation. Driving along the Nawalapitiya-Harangala road, I marvelled at the mountain range giving shelter to the Kotmale Valley as I passed Hapugasthalawa. The Kotmale Oya was reduced to less than a trickle in various places, and as I traversed along Harangala, could see the pinnacle cast of a Chaitya... a few years on the Kotmale dam emerged, and all too soon I had arrived at the Kotmale reservoir. According to historical notes, Kotmale in the 2nd Century BC was the place where young Dutugamunu, the heroic King to-be, lived among the peasants. Kotmale belonged to Malaya Rata. The village of Kadadora is believed to be one of the four entrances alongside, Watadora, Niyangandora and Galdora, to and from the Ruhuna Kingdom to the Maya Kingdom. As such, historical records state that Prince Dutugamunu entered the Malaya Rata from Kadadora, which also happened to be the place where he hid his royal sword upon entrance. During the years spent in Kotmale, it is said Prince Dutugamunu engaged in farming in Masswela and legend has it that he had a love affair with a village maiden named Ran Menika, whose father was a village headman of Urupalassa, where Prince Dutugamunu had hid. At present, this location is known as Kotagepitiya. Furthermore, it is said that hiding in Kotmale, young Prince Dutugamunu had acquired weapons for his planned military campaign against the Chole King, Elara. During the Kandyan period, Kotmale became one of the seven Ratas of the Kandyan Kingdom. 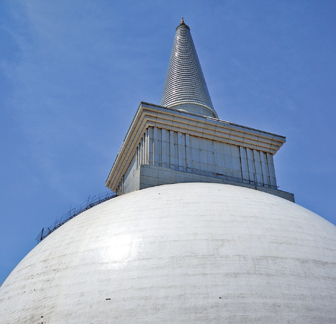 It came under the Gampola Kings during the Gampola Period in the 14th century. In 1977, the UNP led government decided to accelerate Mahaweli Ganga development program, damming five major reservoirs. The Kotmale project was one of the five major projects proposed under the Accelerated Mahaweli Development program. The basic element of the project was a dam at an elevation of 2,100 feet above the sea level on the Kotmale Oya, which is the main tributary of the Mahaweli Ganga. Spread across a land area of 2,270 ha, the Kotmale reservoir, which embraces lands from both Kandy and Nuwara Eliya Districts, is nestled between Tispane and the Kadadora hills. The dam site was located at the historic Kadadora. This resulted in the displacement of 3,300 families from their ancestral homeland and the submerging of the Kotmale valley, after the dam was constructed. 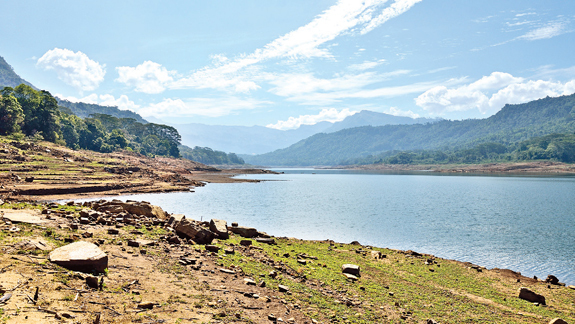 The picturesque Kotmale reservoir was impounded in November 1984. However, 57 villages and about 54 ancient temples, among others are said to have gone under water when the reservoir was built. While many of these temples do not exist at present, some of them still do, even though fully submerged. Among these, the ruins of the Kadadora Sri Priyabimbaramaya are spectacular, especially the sculptured statues of the Buddha and other deities. However, they are a rare sight and can be only viewed according to the whims of the weather gods. These ruins, which lie nestled under the water for more than 30 years, are a nostalgic reminder of the past life of Kadadora village in Kotmale valley. They make rare reappearances during severe droughts in what is a bittersweet reminder of how the people are suffering. These rare situations also provide bittersweet opportunities for some of the villagers whose homes went under water to give birth to the Kotmale reservoir, to revisit the past and reminisce about the days gone by. The temples completely submerged by the reservoir are Sri Priyabimbaramaya-Kadadora, Sri Subaddraramaya-Thispane, Devale-Morape, Bodirukkaramaya-Othalawa and Pattini Devale andGangaramaya-Medagoda. 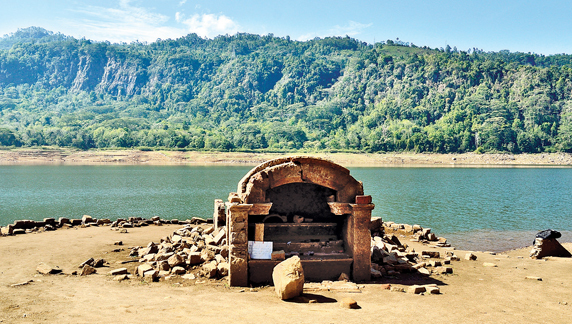 On the right bank of the Kotmale dam at Kadadora, facing the reservoir, a massive Mahaweli Maha Seya (Chaitya) has been built to symbolise the religious aspirations of the people whose Viharas and Devales were lost forever due to the Kotmale project. Rising to a height of 247 feet from the ground and having a 238 feet diameter, this Chaitya stands as a monument to the people of Kotmale.